Look what I found on the side of the road! It has been an long while since I have come upon a curbside treasure – but I may have outdone myself with this one. This could be The Find to End All Finds! I can’t figure out what she might have been — some kind of weird Barbi head/make up toy? I thought she would be the perfect thing to model knitted hats etc. for Ravelry, but that molded hairdo may be problematic. She is very creepy/scary, but I think in a cool way. Others disagree …… what do you think? Creepy and cool, what could be better? She looks like one of those things that jolts suddenly into view when you come around the corner in a fun house. 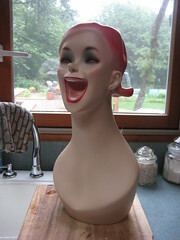 I can’t really decide if she’s happy-screaming or horrified-screaming, but yeah – she’s more creepy than not, to me. I caught a glimpse of her on Facebook earlier and my first thought was: it is some kind of a take on Michael Jackson face (sorry Michael, I don’t mean to be rude) – I don’t mean to insult anybody but I had to share this thought with you. On a second look I think she is very cool! (Or am I misremembering? I could be misremembering.) It’s definitely something that belongs in a carnival!!! Oh my god, she would make the coolest POT HEAD PLANTER (like the one Andrea remembers). She looks in great condition for being a road-side find!! I’m looking at a large photo… does she have PIERCED EARS? I think her eyes are what make her most creepy… kind of like her eyeballs are rolled back in her head or something. I might not have been able to resist her, though, either. Where are you going ot put her?? She kind of looks like you when you are gaffawing maniacally! She’s hysterical! Seriously. I can visualize her sticking out of a roadside trash heap waiting to be rescued! I think you should hide her in the shower! Very creepy! Is she yelling or smiling? I would keep her outside. my mom wants to know if she can borrow it for hat pics! Totally awsome. She can wear all your necklaces so they don’t get tangled. Reminds me of the Soundgarden Black Hole Sun video from the 90’s. I think she’ll make a terrific model! The molded hair looks like it’ll mostly stay out of the way. I think she’s downright spunky! She’d be a great scarf model, now wouldn’t she? Great find! Will make a wonderful hat, cowl and jewelry model. I am so jealous!! That is the coolest thing ever! The best thing I ever got off the curb was a little magenta velvet chair, but this is way cooler!